For the first time Pantone® has chosen two colours as the colours of the year. In 2016 the soft colour combination of Rose Quartz and Serenity shows freshness and gives energy. 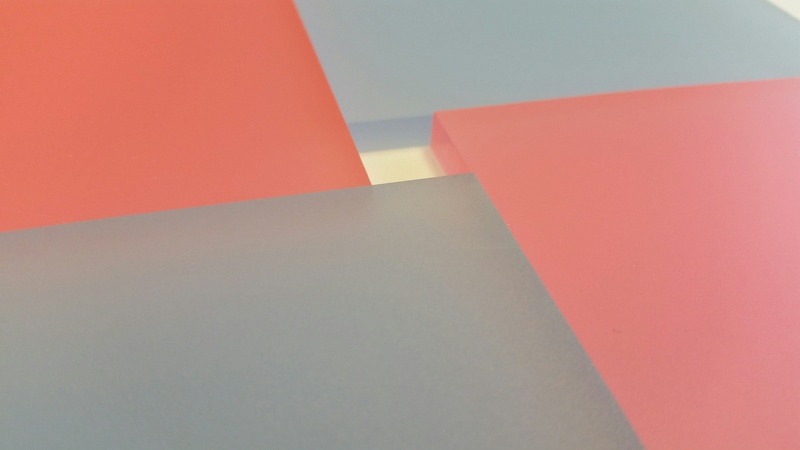 PLEXIGLAS® took this softer approach on colours and offers the fluid colour combination in PLEXIGLAS® SATINICE colours Melon Red 3H04 DC and Ice Blue 5H03 DC. In hectic times and modern day stress the welcoming colours bring balance and seek mindfulness and well-being. The soft matt satin surface of the PLEXIGLAS® SATINICE product presents calm and clear pastel colours perfect for the current fashion in 2016. The interplay of light and lighting is perfect for show cases to make customers feel good in their shopping environment. The two colours Melon Red and Ice Blue joined together reflect connection and wellness. With the easy processing of PLEXIGLAS® SATINICE there is no limitation to your creativity. Ask us for samples of 2016 colours of the year Melon Red and Ice Blue to see how the contrast of both colours gives energy and peace. We were pleased to celebrate our 70th Birthday at Plastral this month!